Way back in 2001, I remember tasting the famous "Molten" at TexMex Chilli a restaurant chain in the US of A. It was our favorite getaway. The days when we did good at work we celebrated with Molten and on days which were rough we pacified ourselves with Motlen. Practically it was every day of the 3 months I spent in Rockford, Illinois. I miss those days which back then felt like never ending torture workwise. Today I miss those days and cherish my time spent with my lovely colleagues. Coming back to Molten it is pretty much like what we know today as Sizzling brownie. However the technique is slightly different and much more sophisticated. There is a piece of round warm chocolate brownie, covered with frozen chocolate layer , the one we find on Choco bar icecream. On top is served, a fresh freezing scoop of vanilla icecrean drizzling with warm chocolate sauce. I always wondered how they managed to freeze the chocolate layer on top of the warm brownie. One had to break open the chocolate layer to get to the chocolate brownie. I wonder if this is still available and if so, with the same name? Back here, sizzling brownie is as much popular now with every cafe serving this. Unfortunately, I do not enjoy it as one I feel the chocolate sauce gets charred and bitter in taste and other I always end up with a burnt tongue. I personally think you dont need a sizzling plate underneath to serve. Sharing my way of sizzling brownie for the combo theme of blogging marathon. 2)Try to cut the brownie in the same size of the chocolate mould. Warm the brownie in microwave for 45 seconds to 1 min. 2) Lay this on a plate. Unmould the chocolate and gently lay it over the brownie. 3) Place a scoop of icecrean. 4) Drizzle with chocolate sauce and serve immediately. Absolutely a sinful dessert, my all tilme favourite..
Oh my if this isn't tempting I wont know what else!..agree the sizzling brownie that's now popular is mostly burnt..I prefer to make my own!..that's a neat idea to freeze the outer shell..good one..
wow thats a very sinful dessert , looks fabulous and makes me drool here !! Your homemade version looks equally delicious & mouthwatering. 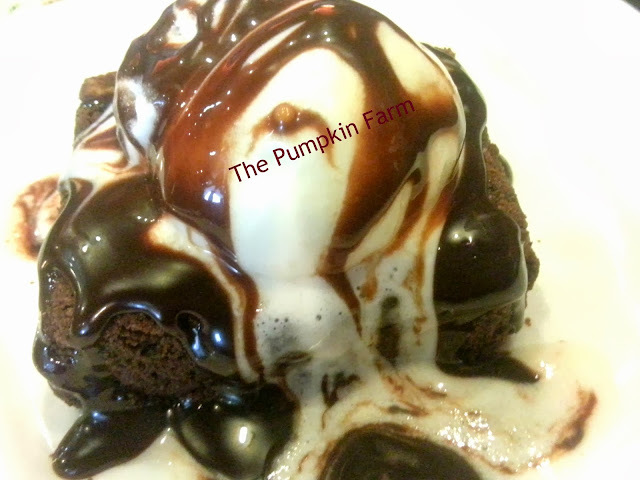 A sinful treat at its best! Chocolate is great for celebrating and for picking us up when we feel down :)..I didnt know about the chocolate layer, the ones we get here is just ice cream + sauce + brownie. Ahh..now my mouth is watering!